Meg Schiffman (Squadra Coppi, 2nd Place Women’s 4): I feel most comfortable if I get 4-5 laps in on the course…which usually means getting there about 3-4 hours before my race. I don’t walk the course, but get a few slower laps in and then one or two just below race effort. My objective is really just to gain confidence and familiarity with the course while getting the bod warmed up. The more laps I get under my belt prior to the race, the better I feel on the start line! I do try to test out lines, look for the dryer ones, etc. during the warm-up laps as well. Patrick Blair: I liked the sharp off camber downhill in the first section of the course the best. Nothing I would change, it was a great course all around. Steevo Cummings: I really liked the long uphill drag toward the pit. I liked that the course required a lot of acceleration, but you could still hold speed through the turns. There was one root up in the woods that I would hit every lap. I had 28psi in the front and it was totally hitting my rim every time. I would take that root out cause it was super far to the pits. Tyler Karnes: Since this is my first full season in cross, I’ve never done Tacchino before. I have heard it had great venues in the past but I loved this one. Being a roadie, the course suited me with long power sections, and less technical sections. There were still some technical areas that kept you on your toes, but everything was pretty smooth. I liked the fast downhill sections, and the area by the pavilion with everyone yelling and cheering. I wouldn’t change anything. Jared Nieters: The course was outstanding, great variety. The course marshals were strict. The distance from parking to registration wasn’t ideal. Tim Brown: I really enjoyed the fast downhill / uphill section in the woods. The course was a lot of fun so I probably wouldn’t change much… although, it would be nice to have one more section that forced a dismount. Meg Schiffman: I LOVED this course. Yes, I’m a tad biased being a Coppi and all, but it really suited my riding strengths, apparently. My favorite part was the muddy drop on the back-half of the course. Super fun. I loved all the tight turns as well – most of the women brake through these, and it drives me nuts. As soon as I had them all to myself, I picked up a ton of speed/ground. Jennifer Maxwell: I liked the front section near the beer garden. The quick tight left hand turn to the barriers and the technical turns that lead to the fast downhill section. The uphill to the pit was a bit of a leg buster but I was able to catch my breath and enjoy the smell of sausage and beer. Change: Elite women should have their own race-not shared with other categories or sexes. Junior rides, especially the boys aged 10-14, were a danger on the course Sunday. I am all for grassroots development but safety is what matters most. elite women fields not to mention B women fields are growing each season. There were 29 B women and close to 20 A women racing out there with 4 other categories of junior boys and girls. Elite women should have their own time spot. It is a growing sport and safely should first and foremost. Jared Nieters: The barriers were oriented very similarly to those at Fair Hill (the day before), so I felt pretty comfortable with them. The turns made the speed a little lower, so I felt like they were pretty routine. Steevo Cummings: The barriers were not super tight out of the turn, and it was a left turn, so I could dismount after turning. I would take the turn outside in, and knew that I could ratchet pedal (in order to build momentum) 1 time before unclipping to run them, which I did on the last lap to try and get a gap on my cyclocross nemesis (Jared Nieters). Meg Schiffman: No major change but definitely forced me into a slower speed coming into the barriers, which helped me to control/think about my technique a bit more. Ended up being an advantage, since everyone else slowed down as well! On my last lap, the Evo gal I’d been following for much of the race cramped up on the barriers. After checking that she was okay (briefly!) I was able to pass her and ride the final part of the course solo. Tyler Karnes: Not really. I took the turn as wide as possible and carried as much speed as I could, and took a couple hard pedal strokes going into the barriers, dismounting right before the first barrier. Tim Brown: I don’t think my approach really changed too much. I just made sure I was in the “right” gear before I hit the turn. Jennifer Maxwell: The more technical course the better I like it. On the first lap a rider went down in front of me on the 180 degree turn and I just went around her and punched it to get a gap on the women behind me. It helped me stay focused and ride a smooth back section. Patrick Blair: No, there was enough space between the 180 turn and the barriers so that I did not have to start dismounting until I was past the turn and hitting the barriers head on. Steevo Cummings: On the third or fourth lap, I was surrounded by two C3 racers and two Haymarket racers. Both teams had an advantage, so I just went with attacks and sat on. I didnt counter attack or pull through when gaps formed. Then when it was just myself and the two Haymarket guys I knew I was racing for 2nd or 3rd. Joe did a good dig up the pavement that got his small gap up to 10 seconds or so, and I knew I had to just set a good tempo and hope he made an error, which he did not. Jared Nieters: About 3 laps in Andy (C3) attacked, and I covered. His teammate Wes went next, and Joe covered. Our group was getting strung out and as we approached the steep pitch in the woods I attacked. The gap opened quickly, and I had about 7 seconds on the field for a few minutes. With nearly everyone gone, Joe ended up coming across to me with Steven Cummings in tow. We rode together for a bit, and Joe attacked. Not wanting to pull Steevo along, my only option was to sit on as Joe rolled away. I was psyched to have Haymarket/Homevisit on the top step of the podium. Tyler Karnes: Early on, Tom Mackay set a hard tempo for the first 2 laps and made a selection. I tried to put in efforts when it mattered. After a few attacks by different people the race was down to three guys. I tried to attack a few times with two to go, but Patrick Blair and Tim Brown kept reeling me in. I knew my chances were pretty good in the field sprint, and I wanted to be first through the last corner. Pat did a good job of keeping me from that, so I went into the last turn second wheel. He opened up a gap quickly and I tried hard to close it. I was in my little ring which didn’t help anything, but I’m used to the junior gears, and once I hit the pavement I was able to wind it up and come around. Patrick Blair: Breaking away from the rest of the field with Tyler and Tim was a critical point because after that it was only a 3 man race, except for Stephen Wahl who was making huge gains on us from 4th place and who might have caught us except for a fumble on the barriers in the last lap! Tim Brown: On the last lap, Pat really ramped up the speed on the long uphill section coming up to the pit/final technical section. I had wanted to make my move here but there was no way I was coming around him and Tyler after putting in that effort. I came out of the final turn in third position and my fate was pretty much sealed at that point… I didn’t have anything left in my legs to out kick either of those guys. Meg Schiffman: Well, I kinda just gave it away in the above question! Woops. I think most of the gals blew up on the first or second lap – this is when I was able to move into the top 5, and stayed there, passing a few more gals as they blew up in the third lap. Coming into the last two laps, I still felt strong and definitely had some left. I kept thinking to myself – you’re going to come in second (at this point, I didn’t realize there was another Cat 4 way ahead of us), just don’t do anything crazy! I was sitting on Laurel’s (Evo gal) wheel for most of the last two laps – this girl can ride. She never once got out of the saddle for any of the inclines – ridiculous! And she never made me pull, which was quite nice of her. When she cramped up at the barriers, I could not believe it. I wasn’t sure what had happened to her – thought maybe her peddle had clobbered her ankle or shin. At any rate, I took off and gained ground on the turns, then really turned it on for the last push through the grassy back section leading back to the podium area. As I crossed the finish line, I totally thought I had won. Not so much. But second place felt pretty amazing none-the-less! Jennifer Maxwell: I missed clipping into my pedal at the start so I was 5th going into the narrow section. I was calm and decided to just wait to move up when we I got to the hilly gravel section. My move came when Lenore went down in the 180 degree turn before the barriers and I was able to get around her and continue on with momentum. Patrick Blair: No, I was super happy with my race and I didn’t even fall down one time! That is huge for me, I usually fall down a lot. Tim Brown: If I had a chance to do it all over again, I think I would have tried to attack / gap Pat and Tyler early instead of waiting for the bunch sprint. I’m not sure if I would have been able to stay away but it would have been fun to try. Steevo Cummings: I am really happy with my result. In theory I should have gone with Joe when he went for the win, but that could have been disastrous. Tyler Karnes: I probably would have put in a few more attacks on the sections that I was strongest, but a win is a win so I am happy with my result. Jared Nieters: The error I made was not attacking Steevo earlier. I was really comfortable and gambled on the sprint, which I mis-timed. I should have hit him earlier, maybe with just over a lap to go. I’ve been kicking myself for three days now. Meg Schiffman: Not really. I had zero expectations going into the race, and just wanted to finish! When KenBob told me I was top 5 after the first lap, I couldn’t believe it. At that point, my competitive spirit took over – I had no choice but to try to pass every chick ahead of me. Jennifer Maxwell: Clip into my pedal at the start. Patrick Blair: Take the time to really study the course and memorize tricky sections. Steevo Cummings: Find your local cyclocross practice, you will learn more in one session than I can say here. Two ok bikes are better than one fancy bike. Listen to your elders, the elite masters field is full of really accomplished people, ask them questions. Stick around and watch the Elite races, you will learn a lot by watching, and cheering. Tyler Karnes: Have fun, don’t let it get too serious, this isn’t your job. Jared Nieters: Don’t take risks in tricky sections. You won’t win a race in the off-camber turns or the barriers, but you can definitely lose the race there. Tim Brown: I’m new to the sport so I might not be the best person to be asking… but I’d say just have fun. That is what it’s really all about anyways. Meg Schiffman: Don’t give up! My first CX race was Charm City this year. I sucked. I fell a bunch of times and quit after the 2nd lap. I’ve never quit a race in my life! I regret that I did that, and made a promise to myself that I would never quit again. It takes patience and practice to feel confident in cross. It took me awhile to really get the hang of it, but now, only three races later, I ended up on the podium. So don’t give up!! Jennifer Maxwell: I recently told my dear friend Marni Harker that she just has to come back and give it her all week after week. Cyclocross success comes with lots of racing and luck. This advice proved helpful to Beth Mason who could win road races with her strong sprinting skills but could not understand why she was hanging on for dear life at the back of the pack in a cross race. She came back year after year determined to improve and this year she is doing well against the elite women. What did you eat for breakfast? Anything after that and before racing? Patrick Blair: I always eat oatmeal or cereal for breakfast (low sugar versions). After that I drink a bottle of Cerasport, which helps keep muscle cramps away, and a power bar. I usually drink some sort of caffeine 1hr before the race. Steevo Cummings: The Elite races start so late, I have to eat twice. I ate a bagel with peanut-butter and jelly for breakfast. Another one for lunch around 12. I was worried about hydration, so I really stayed on top of it. I drank 2 bottles of nuun while warming up and pre-riding. Jared Nieters: For breakfast I had three slices of French toast with Vermont maple syrup, a yogurt, two Morningstar Farms Soy-sausages, and two cups of coffee. I had another yogurt and an apple and cheese sandwich at noon. Tim Brown: For breakfast I had a big bowl of cereal (a mix of granola, shredded wheat, and cheerios) and tall glass of OJ. And then maybe an hour or two before the race I had a banana and a Clif Bar. Meg Schiffman: I had oatmeal (with protein and flax) plus an Americano – I eat/drink this every day though, so nothing special. Then I ate a banana as a snack around 10 am. My pre-race meal is a whole wheat bagel with almond butter – at noon. Right before the race (it was close to 2 pm at that point) I had a half of an energy bar and Monster. Winning combo! Well, second place combo, anyway. I make sure to drink a ton leading up to the race – probably 2 full water bottles or more. Jennifer Maxwell: Breakfast: 3 soft boiled eggs and 2 cups of strong brewed Columbian cafe from the Maxwell House. Dinner: Bison and veal chili a la Maxwell House. Patrick Blair: Jim McNeely!!! Awesome race!!! Thank you. Steevo Cummings: Coppi and the promoters for doing an awesome race. Riskus family for putting us up. Indiana Regional Medical Center. 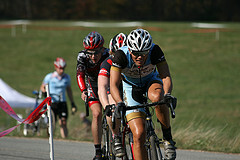 Brody for driving me around, having Fugazi cds in DC, and racing his first elite race! Amy (http://garbelladesign.com/). Anybody who sticks around for the last races and cheers, you guys rule (fatmarc). Tyler Karnes: Thanks to Greg Wittwer for giving me some great advice on Sunday and helping me out this season. To Travis Mcmaster and Dave Griebling for putting a great program together at Pioneer. GT bikes for providing us with sick rides. Jared Nieters for keeping my head in the game. Jared Nieters: Propers to HomeVisit—ur new sponsor (website coming soon), Haymarket Physical Therapy and Chiropractic, and Curtis Prosser for making sure the shop stays afloat while I’m off racing. Tim Brown: Big thanks to Coppi and all who helped put on a great race! I also can’t thank the Bike Rack enough for their support. And last but not least, TRE. Meg Schiffman: Go Jim McNeelums and Lindsey H and all the Coppi volunteers for putting on a phenomenal race!! Whatta team. Jennifer Maxwell: “The Rocket,” Marni Harker—keep up the cross racing week after week!